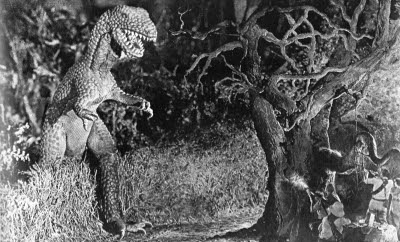 The mother of all giant monster movies returns in a problematic new restoration. There is a lot to like here, so perhaps my reservations are merely… a QUIBBLE? I hold out hope that I will see a restored print of London After Midnight before I shuffle off this mortal coil (of nitrate film.) You heard me, medical science: keep me alive! ALIVE, I say! Serge Bromberg and Lobster Films’ The Lost World is an ambitious restoration, given the film’s rocky history. A sensation when it was first released, The Lost World was taken out of circulation when First National sold the rights to RKO Studios and destroyed all circulating prints in 1932. Why were all known prints destroyed (I hear you asking)? Why was the film taken out of circulation? Well, RKO’s then-new King Kong bears more than a passing resemblance to this older, silent film, and by “bears a passing resemblance to,” I mean “is a direct copy of.” Kong apes (ha!) every aspect of the older film: structure, story, characters, climax. Oh, one crucial difference: it’s a brachiosaurus that gets loose and destroys a major city during the climax of The Lost World. Other than that, it’s practically the same movie, and RKO did not want the source material lying around where anyone could find it and claim plagiarism. Being out of circulation made The Lost World very difficult to see for decades. There was an abridged Kodascope version (Kodascope was an early watch-at-home film format) available for those who went looking, but the full-length The Lost World quickly became more like The Lost Film. Lobster Films found the missing footage, piecing together no fewer than ten different source prints to return the film to its original length. Lobster Films commissioned a rousing new score from Robert Israel, and tinted the film to match its original theatrical exhibition. 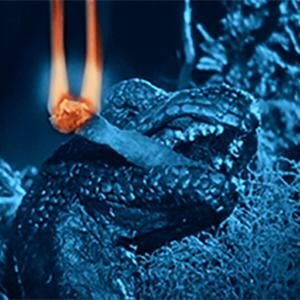 Their restoration wizards even hand-tinted a scene where an allosaurus carries a burning torch in its mouth. All of this is to be applauded, and loudly. 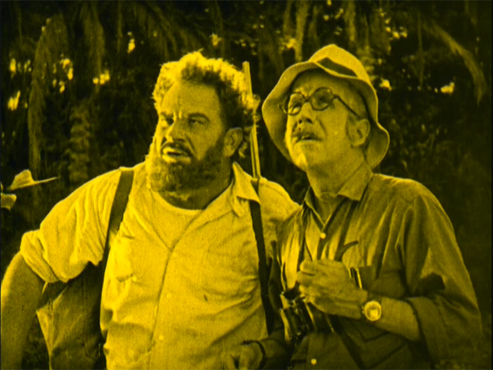 The Plot in Brief: When daredevil Professor Challenger (Wallace Beery) claims to have visited an Amazonian “lost world” where dinosaurs still exist, no one believes him because he is the only member of his expedition to have made it back alive. To clear his name, Challenger proposes a second expedition and asks for volunteers from the naysayers at the British Explorers Club. Joining Challenger for the foolish, laugh-in-the-face-of-death-by-dinosaur second expedition are Paula White (Bessie Love), whose father died in the first expedition; Sir John Roxton (Lewis Stone), a resourceful and respected big-game hunter; newspaper journalist Edward Malone (Lloyd Hughes); and comic relief ichthyologist, Dr. Summerlee (Arthur Hoyt). Will this plucky group encounter big dinosaurs and high adventure? You betcha! I am of two minds on the latest Lobster Films restoration. 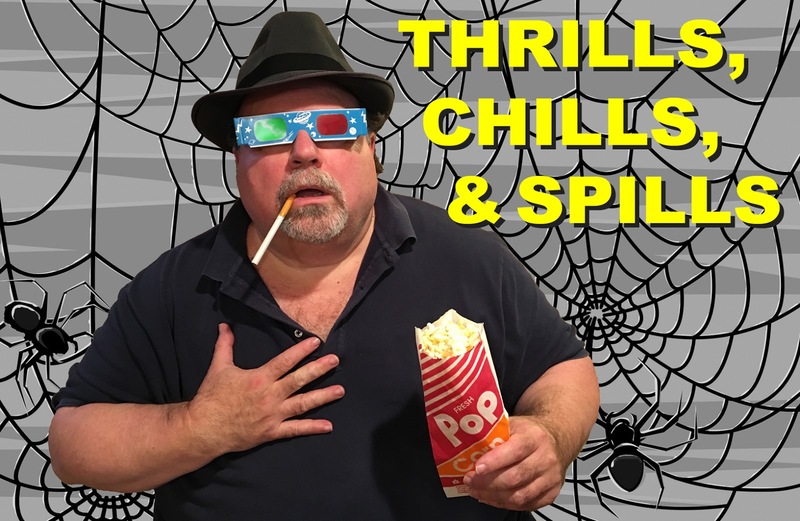 I am happy to have the film back to its original length, and I recommend this version to movie fans, King Kong fans, and fans of monsters that fight each other. Yet the restored version is a sometimes-difficult watch. 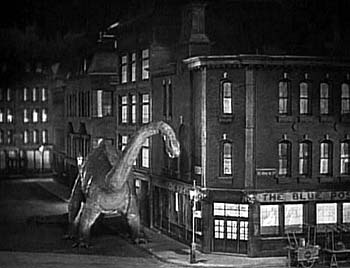 Most narrative films ask us to suspend our disbelief, and a silent film about giant dinosaurs is no exception. Yet this becomes difficult when the varying source material keeps pulling us out of the film. The most recently recovered material from Czechoslovakia is badly scratched, and so the film ping-pongs between pristine and battered. Every time the scene changes, we’re reminded that we’re watching a 92-year-old film with a complicated provenance. Now, I am a purist, and I am happy to have the complete, original film, but there is a question here of presentation and intent. I compare this to the series of restorations done on Fritz Lang’s masterpiece Metropolis. After releasing what was thought to be the definitive version to theaters in 2002—a beautiful print with a beautiful score—still more footage was discovered. The new footage was badly damaged, but restorers decided to incorporate it into the next definitive version anyway. This subsequent restoration received a theatrical release in 2010. I was happy to see the missing footage; one specific subplot in the film, long excised, was back and now made sense. But the earlier, incomplete restoration was the more satisfying theatrical experience. That 2002 print was pristine from beginning to end (the then-missing footage was explained in additional title cards.) The viewer was free to simply experience Metropolis as a work of art—just as audiences would have in 1927—without the jarring reminders of age, and damage, and the other vagaries of time. This leads me to wonder: what is the most critical criterion when restoring classic films? Is it most important to include every frame of the original negative, no matter the quality, for the sake of completeness? Or is a satisfying theatrical experience, where the audience can most fully enjoy the narrative, more important? 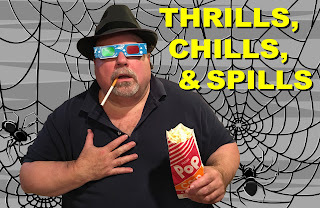 I am not a filmmaker; I am a retired English teacher. I would love to hear some filmmakers weigh in on this. Theatrical exhibition aside, I believe disc releases could offer us a happy compromise. In the case of both Metropolis and The Lost World, I wish the discs offered a pristine “narrative” version, with the compromised found footage provided as a bonus supplement. For purists, a seamless branching option could re-incorporate that footage back into the presentation. Viewers could easily have it both ways, and enjoy the best of what this important restoration work provides in the format that satisfies them most. So, F-Heads, which version would YOU watch more: the “purist” or “escapist” version? Would it simply come down to whichever version was the disc’s default? These are the questions that keep me awake at night. These questions… and giant dinosaurs! i'm just a movie fan, but i'm of two minds. on one side, i like to have the complete, as intended version of the film. and on the other side, i would prefer to see those added scene as deleted scenes in the bonus section. that being said, i have the blu-ray for Metropolis and i loved the new longer cut, scratch and all. the best would be to put both versions of the film on the blu-ray. i'm planning to buy this Lost World soon. i can't remember if Metropolis has only the longer cut or both. i'll have to check when i get home. Can't argue with multiple versions and seamless branching, now, can I? What I can quibble with is the blu's $35 price tag. I have no doubt that the Lobster Films team are good folks, and only charging what they must to make such a fine product commercially viable, but I'm afraid that's just too high a price for moi, for any film not starring my own self. Sorry to be a Debbie Downer! The package does sound terrific. i finally got the blu-ray. for the low price of 18$ plus shipping on amazon.com. it ended up costing me about 30$ in canadian money to get it. on amazon.ca, the thing is more than 40$cad.